Newest Wearable Hybrid RFID Reader Is Coming! Apr 08, 2019—RFID technology company Feig Electronics demonstrated its HyWEAR compact fingerless glove device at last week's RFID Journal LIVE! conference and exhibition. 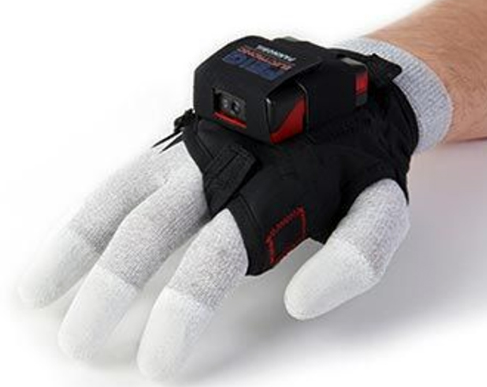 The device, worn as a glove, enables workers handling cargo or assets to read or scan labels on items they pick up or handle, without stopping to pick up a handheld device. The device was launched at LogiMat in February 2019. It is designed to have a longer-range optical function to scan bar codes from a distance of 3 feet, while the UHF RFID reader is designed for short-distance reading of 12 inches or less. In that way, users can be sure they don't pick up stray RFID reads from items in the area that they are not moving or manipulating. The HyWEAR comes in three versions: the hybrid RFID and bar-code scanning device, as well as separate bar-code scanner and UHF RFID reader models. It includes Wi-Fi roaming functionality to make it easier to share read and scan data with a server. The HyWEAR device can roam from one wireless cell to another as a user moves around a facility, such as an airport or large warehouse, without having to log in to a new router. The HyWEAR also comes with LED lights and an audible tone to signal that a tag has been read or scanned—but it also includes a vibration buzzer, providing feedback for users, especially in noisy environments. A switch next to the glove's index finger can be used to trigger the device, in order to conserve battery life when not in use. Users can also switch the HyWEAR's operation function between RFID and bar-code scanning. Its UHF frequencies range from 865 to 868 MHz (for use in Europe) to 902 to 928 MHz (for North America). The HyWEAR also has Bluetooth functionality so that it can share data with a smartphone or another Bluetooth-enabled device. As such, when an individual carries a phone or tablet, either in a pocket or simply in a vehicle, that device can capture the HyWEAR read data and forward the collected information to a server via a cellular connection when a user is on the road.